MTP presents Party on the Bridge for 4th of July Fireworks!! MTP Modern Transit Partnership presents "Party on the Bridge"!! Bring the whole family and enjoy an Amtrak train ride from The Harrisburg Transportation Center onto the CORRIDORone Bridge on the Susquehanna River. What a great place to see the 4th of July Fireworks!! Riders will enjoy a private party, beverages and light hors d'oeuvres will be served, and you'll have the best seat in the city for the City of Harrisburg's Independence Day Fireworks Display!! For more information, visit www.mtptransit.org/news-center/events. While in town, stay at the Bridgeview Bed & Breakfast. Our river-front lodging has a beautiful view of the Susquehanna River, Blue Mountains and Famous Rockville Bridge. Call or click today for reservations!! From the archive: Sunday May 27th saw a lot of different power on Rockville Bridge. Shown here is CSX run through PPL coal train coming into Enola from Hagerstown. Come see run through trains at the Bridgeview Bed & Breakfast There's no better view of the trains crossing the Rockville Bridge, than from our deck!!! Follow the exciting summer sightings around the Bridgeview Bed and Breakfast; a closer look into birding. You may question our location being an ideal spot as we are not a remote location but a wide variety of Pennsylvania's most sought after birds have "checked" into the Bed and Breakfast this summer. A family of Baltimore Orioles and Orchard Oriole has nested on the grounds and can be spotted going to and fro busily collecting food for their young. 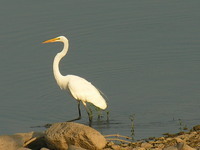 The Great Egret can be seen walking to property, as well as along the water with a "fishing" buddy, the Black-crowned night-heron. When looking out onto an "island" in the Susquehanna River you maybe able to catch a peek at the majestic Bald eagle perched in its nest. A special thanks to Tom and Mary Ellen Heisey for sharing their bird expertise. 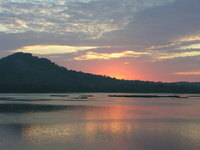 Visit the Bridgeview B&B website to view our sightings, rooms and rates. 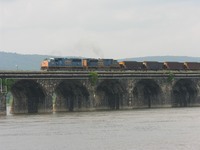 A pair of SD-70m-2's cross Rockville Bridge and head up the Buffalo Line. Come see Foreign Power at the Bridgeview Bed & Breakfast There's no better view of the trains crossing the Rockville Bridge, than from our deck!! !